Eating too many calories and fat can prevent you from losing weight. Cheese is often lumped into a category of dieting “don’ts” because of its calorie density and saturated fat content. While too many calories from any food can derail your diet goals, small servings of cheese may actually help you reach your weight loss goals. Cheese comes in thousands of varieties, some with a higher percentage of fat and a greater number of calories than others. Hard cheeses, such as cheddar and Parmesan, contain about 110 calories and 9 g of fat per ounce. Blue and brie cheeses contain just below 100 calories and 8 g of fat per ounce. Feta and part-skim mozzarella cheese provide about 74 calories per ounce and just 4 to 6 g of fat. A cup of 1 percent cottage cheese contains 160 calories and 2 g of fat. A 1/2-cup serving of part skim ricotta has 170 calories and 10 g of fat. The U.S. Department of Agriculture Food Guide Pyramid recommends 3 cups of milk or dairy equivalents daily to help you get enough calcium to support bone-mass. A 1 ½-cup serving of hard cheese, or 2 cups of cottage cheese, counts as one of these servings. In a study released in October 2009, researchers from the Curtin University of Public Health in Australia found that dieters who increased their daily dairy intake to five servings lost more weight and belly fat than those who stuck to the standard three servings after 12 weeks. Low-fat cheese was included as part of this study’s dieting regimen. Cheese also provides protein, about 8 g per ounce, and phosphorus for strong bones. A 1-cup serving of cottage cheese provides 28 g of protein – making it a filling diet snack. Even when dieting, you need some fat in your meals to help you feel more satisfied and to support some body functions. 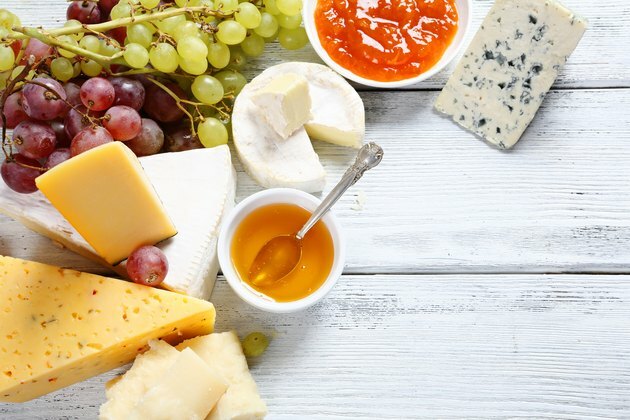 Although you want to keep saturated fat to less than 7 percent of total daily calories, adding a little cheese to meals can help you feel less deprived. Skip non-fat hard cheese, which has a rubbery texture and does not melt smoothly. Low-fat versions of cottage, cream, ricotta and mozzarella do not change much texturally or taste-wise. Use full-fat cheese strategically, when you can actually experience the flavor. Skip cheese on sandwiches and tacos, where you compete with the other ingredients to taste it. Hard cheeses, such as Parmesan, Romano and Asiago, have a strong, salty flavor – so you only need a small amount to boost flavor of otherwise boring low-calorie foods. Use grated Parmesan to flavor low-calorie vegetables or air-popped popcorn with just 22 calories for 1 tbsp. Switch to low-fat cheese when recipes call for ricotta, mozzarella or cottage cheese. Opt for low-fat cream cheese for baking and to top your whole-grain bagels to save 3 g of fat and 20 calories per tbsp. Look for triangles of low-fat, flavored cream cheese containing just 35 calories each. These spreads provide a low-calorie way to flavor toast, rice cakes, celery sticks and sandwiches.